Last month I gave you a couple of dates for things I thought you might be interested in. One was the online solar cooking class (replay still available, click here for that). The other was for The Prepper Bundle. 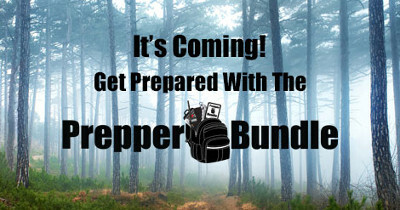 The Prepper Bundle a collection of eBooks and videos similar to the Back to Basics Living Bundle I've participated in for the past two years. This bundle, however will focus strictly on preparedness. It will be available June 7 - 12, but if you'd like to get a discounted or free copy, consider becoming an affiliate. Make the bundle available on your blog, website, or email list, earn a commission, and if you sell five copies you get a copy for free. If you sell less, you still get it at a nice discount. Click here for more information and to sign up to become an affiliate if you're interested. So what's going to be in it? I just received my own author copy, but since some of the listings still tentative, we've been asked not to talk about specifics (don't you hate that), other than I can tell you that my own contribution will be my How To Bake Without Baking Powder. I am really impressed with the books and authors, very happy with the content, and hope it works out that they'll all be included in the bundle! Specifics will be available on June 7, so here's my question for you. Ya'll know that the typical marketing gimmicks aren't me. For the Back To Basics bundle, I just did a series of book reviews during the week of the sale. So my question is, would you like me to do that again for The Prepper Bundle, say, an introduction on the first day an a book review each day during the sale? Or would you prefer just an introduction on the first day, a closing reminder on the last day, and regular blog content in between? Being a bibliophile myself, I love doing the reviews but if it's overboard, let me know. I always love your reviews, they're not overboard. Thank you for the information on when the bundle will be out.